Home > Advice > How often does your chimney need sweeping? How often does your chimney need sweeping? IT’S FAR too easy to forget that your chimney needs regular sweeping by a professional. 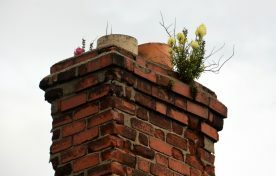 After all, the inside of the chimney is hidden from sight and so the condition of the flue isn’t visible to the naked eye. When a dusty corner of a home is spotted, a horrified homeowner will quickly get the hoover out and clean it up. Yet keeping the chimney clean is far more important for the simple reason that an unclean chimney puts your family at risk of carbon monoxide poisoning. Even so, how many times per year should your chimney be swept by a member of the Guild of Master Chimney Sweeps? The short answer is as many times as possible but, of course, chimney sweeping does cost a bit of money, usually somewhere between £60 to £150 depending on the service being offered and perhaps your location . It is far better to consider the value that is included in your sweep’s service. Professional sweeps will make many additional checks that you will be unaware of. Ask them whilst booking. There’s a great deal more to it than pushing a brush up a chimney! It depends too on the type of fuel used and the chimney will definitely need sweeping regularly, no matter the fuel type. As a general guide, for smokeless fuel and gas, it should be once per year; for wood, quarterly when used and for bituminous coal, quarterly when used. If you have a liner in your flue – it still needs sweeping. Please don’t listen to anyone telling you otherwise. Sascha Meding, vice chairman with the Guild of Master Chimney Sweeps, says: ”Regular servicing and sweeping of your chimney will ensure you make the best use of your fuel and appliance. “Sweeping gets rid of soot and other residue, allowing dangerous gas to leave your home safely. “Your Guild sweep will also give you best advice about the chimney’s condition and make sure everything is in order for you. Find your local professional chimney sweep now – in the Findachimneysweep directory.